The cut leaf of the aloe plant is a widely used treatment to heal minor cuts, scrapes and burns. 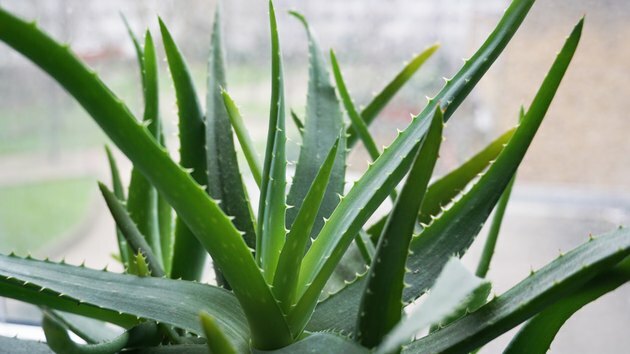 The NYU Langone Medical Center explains that aloe reduces healing time and its viscous nature allows it to adhere and form a seal over a healing wound. Aloe is generally used in its topical form, by cutting off a fresh leaf of this succulent plant and applying it directly to a wound. In addition, aloe vera is available in oral form, as a juice extracted from the leaves of the plant. This juice is used to treat a variety of conditions such as ulcerative colitis and ulcers however more research is needed to effectively support the use of oral administration of aloe vera. A gastric ulcer is actually a peptic ulcer that develops in the stomach, according to PubMed Health. This condition is characterized by a wearing away of the protective mucous that covers the inside of your stomach. As a result, stomach acid can make its way through the stomach, causing an ulcer. A 2004 article published in the "Journal of Ethnopharmacology" found that administration of oral aloe vera appeared to have a protective effect on the lining of the stomachs of laboratory rats. The researchers explain that aloe may impair the secretion of gastric acid that can cause pain and erosion of the stomach wall. Part of the inflammatory process your body enacts for protection is inflammation in which leukocyte cells adhere to an area of injury such as an ulcer. This allows the affected tissue to heal and protects it from further injury or infiltration by bacteria. A 2006 study published in the "World Journal of Gastroenterology" found that administering aloe vera to laboratory rats decreased leukocyte adherence while also promoting the healing process. Additionally, production of new cells to line the walls of the stomach increased, reducing healing time. More research is needed to determine if this effect also occurs in human subjects. Aloe gel, the inner part of the leaf that is usually applied topically after cutting, is considered possibly safe for ingestion, according to MedlinePlus. Conversely, aloe latex, extracted from the layer just under the green leaf, can have serious adverse effects when ingested. Aloe latex was a common ingredient in laxative medications sold over-the-counter but was banned for this use in 2002 by the United States Food and Drug Administration. The National Center for Complimentary and Alternative Medicine explains however that aloe latex is often the primary ingredient used to make aloe juice. Long-term consumption of aloe latex is associated with altered electrolyte levels, impaired kidney functioning and weakening of the muscles. Aloe juice may provide some relief from the pain of an ulcer or inflammation however the risks may outweigh any benefits. The National Center for Complimentary and Alternative Medicine state that aloe vera ingestion has been associated with increased carcinogenic activity in laboratory animals. Aloe juice can also lower blood glucose levels and impair the effectiveness of certain medications such as blood thinners and medications used to treat diabetes. If you are currently taking a laxative medication, consuming aloe juice can add to its effect and cause significant abdominal discomfort. Check with your doctor before ingesting aloe juice.